Manila, 11 July 2016 – Epson has been named as the world’s number one projector manufacturer for 15 consecutive years by Futuresource Consulting1. The milestone demonstrates the company’s market leadership and success in the visual imaging industry. The latest findings from Futuresource indicate that Epson has the largest market share for 500-lumen and above, for projectors worldwide, at 32.1% for 2015, an increase from 29.4% in 2014. 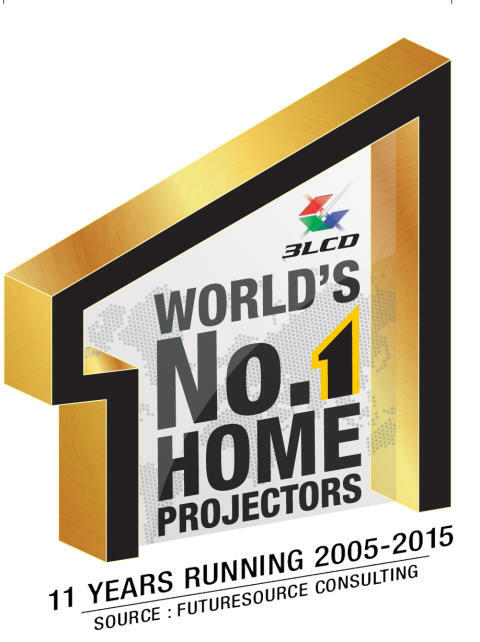 For the home projectors segment, Epson has also achieved largest market share for 500-lumen and above, for home projectors worldwide for 2015, which stands at 35.1% for 2015. Epson’s worldwide market share for projectors have increased steadily over the last 15 years, to maintain its market leadership over the years. Within Southeast Asia, Epson continues to maintain market leadership, with market share increasing to 28% in 2015, up from 24% in 2014. Epson has a broad range of projectors that caters to different sectors, from enterprise projectors for classroom and small and medium meeting rooms, to interactive projectors for education and enterprise sectors, as well as high brightness projectors for large venue installations, rentals and staging venues. At the heart of Epson’s projectors is 3LCD technology, which enables Epson projectors to deliver the most vibrant and true-to-life images with up to 3 times higher colour brightness compared to 1-chip DLP projectors in the market. In contrast to 3-chip 3LCD projectors, 1-chip DLP projectors use a rotating color wheel that spins at a rapid speed, only displaying colors sequentially, which can result in color break-up or the “rainbow effect”. “We are continuously investing in innovative products and technologies to strengthen our position as market leader, and to create new value for our customers worldwide. We are proud to achieve this position, and as a company, will continue to drive innovations to create new visual experiences for our customers,” said Eduardo Bonoan, Senior General Manager and Head of Marketing, Epson Philippines. 1 Data from Futuresource Quarterly Market Insight Reports. Sell-in volumes, representing at least 95% of the worldwide market, are collected from manufacturers each quarter. Data is cross-checked with inputs from distribution channels and component suppliers. This data collection methodology enables Futuresource to accurately size the Projectors Market and provide detailed brand, specification and application shares in over 66 countries worldwide. Epson’s corporate presence in the Philippines commenced in 1998. It grew rapidly into a billion peso company in a span of a few years from its establishment due to its client-oriented approach in its business management style by its dedicated and innovative staff members and officers. Epson Philippines has an extensive network of 77 Authorized Service Centers nationwide with more than 200 dealers and more than 800 shops across the Country. For more details, please visit our website (www.epson.com.ph) or our Facebook page (http://www.facebook.com/EpsonPhilippines). Prior to publication, it must be approved by Epson Philippines.